When the good times keep getting better and better. Snowballs are just waiting to become snowwomen. I was woken up from a restless sleep by that sound that a dog makes as it’s getting ready to ruin your white carpet (thanks previous homeowner, that was a super practical choice) and just knew it was going to be one of those days. From there things just continued to get worse. The coffee pot overflows, the orange juice gets spilled all over the table, we’re running late which makes everything hard because I’m saying the phrase “HURRY!” to both myself and everyone in our family and that just adds to the chaos and negative energy. What the heck is happening with today I think and I recognize it immediately: The Snowball Effect. That’s not the only way The Snowball Effect can work though. It can also work the opposite way where the good times just keep getting better and better and I have great news: you can do this too. There’s a few kinds of snow — there’s the flakey white stuff that you can blow and it explodes into a cloud of cold landing like baby powder, the kind that lives in glitter snow globes that seems to hang out but never hits the ground, and then there’s the big fat snow that falls like thick dense marshmallows and hits the ground and releases that jovial WOOOOO! because it just got reunited with their favorite flakes and it’s about to be a party up in here! Now think of your thoughts like those same different kinds of snowflakes. You’ve got the negative thoughts that seem to just whirl around and pile up and when they get stirred up everything gets crazy. The reflective thoughts that flicker around like the glitter snow but never seems to land and then you’ve got the grounding grateful good thoughts that stick together to become the glue of a really beautifully loved life. Creating those good grateful grounding thoughts can happen organically, but it doesn’t always work like that. Somedays the other snow whirls around in such a flurry that you creating that good juicy fat snow has to happen on purpose. CREATE the good juicy thoughts FIRST, find the goodness as you start your day, meditate and marinate in them, give a prayer of thanks and a prayer for more please! The next rule in snowball making is that you start to pack that good snow together in your own hands; in the same way you pack your good thoughts together in your mind. This is really important because sometimes we hand over all of our good snow and good thoughts to other people and expect them to pack this snow into a great snowball and they have no idea what you’re trying to build here. Don’t put this job in someone else’s hands. This is YOUR good gets better and better snowball. Other people can be like that neighbor who would step on your snowman just as it was starting to get going and laugh maniacally. 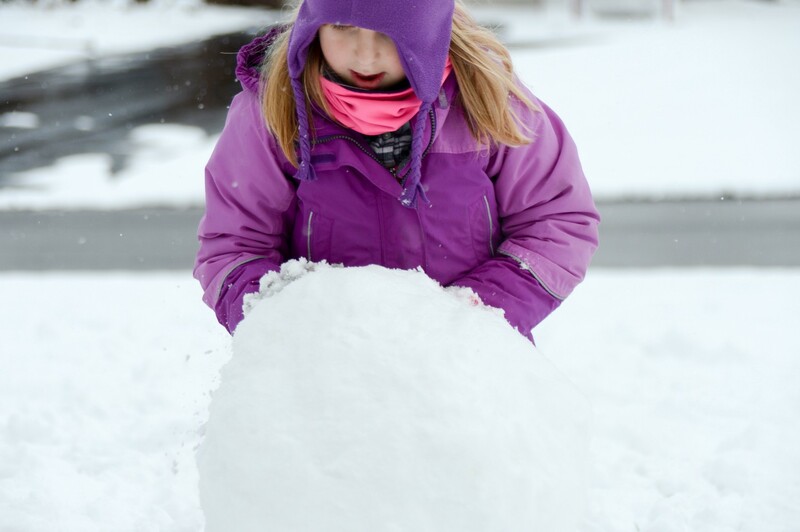 When you’re making this giant snowball in a yard you know that the moment you put it down on the ground and start to nudge it forward is critical. Will the snow stick? Will it really start to grow? You watch it closely and add a little snow on the sides with your hands. This is like starting your day with other people. You enter the office and now it’s time for you to nudge this bigger and better snowball of happiness forward. You start the day with someone who is happy instead of interacting with Negative Nancy right from the get-go. You set people up for success asking them a question that’s going to make them happy (The new picture on your calendar is beautiful- is it a whole year of tulips or do they change each month?) or start with a positive (I had the best coffee this morning from that new place, have you tried it yet?). You start your day with a project that you really like doing so you create some positive momentum. At some point your snowball of goodness hits a rough path, it could go either way from here — things can start to fall apart or you can push on with the goodness. Put your back into it means that you’re going to push up the hill of negativity and continue to seek the positive to build on those good grateful nourishing thoughts that create the better and better snowball. This is where things really take off. You’ve got a really big snowball and you’ve attracted some attention. People are coming around to admire it, “how’d you do it?” they’ll ask, they’re wondering if they could do it too and that’s when you share with them the secret that you start with the right snow. You tell them about it and while you’re talking you notice they’re pushing your snowball too and it’s bigger than you could have ever made it on your own. It’s no accident or mystery: when things are good they do get better and better and while the opposite is also true you also have ALL the snow you need to stop that negative snowball in it’s tracks and build something so much better. Real talk: Sometimes I feel like I want to tap on the microphone of the Internet and say: Is this thing on? So I’m doing that. Did you get to this point? I’d love to know if you’ve thought about this idea before, if you’re going to take any of these secrets above into action, if you read it and thought it was complete ~meh. Let me know this thing is on. Thanks in advance, I appreciate it a lot!